Jingle all the way with Mirtha! It's that special time of year again and no, I don't mean income tax rebate time! It's the most wonderful time of the year - to paraphrase a Christmas song. So let's celebrate - we have three special guests today - Red Black, his lovely wife Rita, and DebbieTheSeedQueen! Don't forget to run your mouse over the pictures on this page to see the finished products or the works in progress! Red: Hi there Miss Mirtha. Holiday Greetings to you and yours! Well I have a simple (like me) project and all you need is scissors, a hole punch and some duct tape. Mirtha: Duct tape!!! I should have known! Oh well..go ahead. Red: Actually it's a project from my latest book, "2002 Uses For Duct Tape." I had way too many to put in the first book! Mirtha: Hmmm..I must have missed that one. Send me a copy Red? Red: Will do! Here we go: Cut a strip of duct tape about 10" long. Fold it over onto itself so the two sticky sides are touching. Then just cut out some Christmas shapes. Pop a hole into the top with the hole punch and insert an ornament hanger. The silver duct tape is perfect for Christmas ornaments. Mirtha: Hey that doesn't sound half bad. You could even dress it up by gluing on sequins or bows! Thanks Red! Now where's your lovely wife Rita? Red: Right here - your turn honey! Rita: Thanks dear - now go invent something- it's time for girl talk. Mirtha: (laughing) What a guy! Rita: Yep - I think I'll keep him. Hey Mirtha have I got a great Christmas recipe for you! Mirtha: I can't wait! What is it? Rita: This is one of Red's favorites. I would like to share the recipe for Christmas Cranberry Salad. It takes: 1 lb. 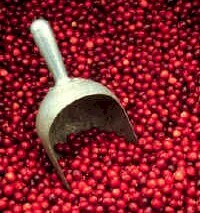 finely ground cranberries, 2 cups white sugar, 1-20 oz. can crushed pineapple-drained, 1-16 oz. pkg. miniature marshmallows, 1 cup chopped pecans (optional), 1 pint whipped cream-beaten stiff. Mix together the cranberries and sugar, refrigerate overnight. The next day, combine the cranberry mixture with the pineapple, marshmallows, pecans and whipped cream. Mix well. Pour into a 3 qt. 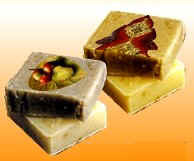 dish, cover and refrigerate or freeze until ready to use. Mirtha: Mmmmmm...I can just taste it now. Hey Rita when you're here we usually put the fruit on my face. Now I can really eat it eh? Rita: Better than the egg on your face my dear. Well I better go find Red before he gets into another scrape. Happy Holidays Mirtha! Mirtha: Thanks Rita. Same to you. And last but definitely not least is Debbie, her Royal Highness the Seedqueen.she has a soapy Christmas craft for us. Debbie: Hi Mirtha! Yes. I have been told I am all washed up! Mirtha: You said it. I didn't. Ok seedy one, let's have it! Debbie: I really like this one a lot because it recycles those old Christmas cards that usually just get thrown away. First you need to transform the cards into decals. Cut down the card to a smaller size, if needed. With a sponge applicator, evenly apply 8-10 coats of ModPodge or other decoupage glue over the color side of the card. Let dry thoroughly between coats. A hint for even coverage: apply each coat of glue in an opposite direction. Soak the card in water for one hour or until paper backing can easily be peeled off and separated from the decal. Rub or roll the paper off gently with your fingers or paper towels, so you don't put a hole in the decal. Let dry completely and then glue decals to soap with the same glue. That's it! Mirtha: Wow Queenie - that sounds really cool, I'm going to try this one too. It would make a great addition to a bathroom themed giftbasket. Merry Christmas Debbie! I would like to say thank you to all three of my special guests this month. For Red Black I wish an unlimited supply of duct tape. For Rita Black I wish an unlimited supply of patience to deal with Red! For Debbie, I don't know what to wish for - I think she has everything, so I'll wish you health and happiness and my "Mirtha's favorite dish". Debbie: Some of your money would be nice. Mirtha: It's all hard earned money sweetie. Debbie: Will you ever retire?